I really don't know how I bought this coin without being more aware of the carbon mark on the obverse. I certainly SAW it. But somehow it just didn't register with my brain as undesirable. 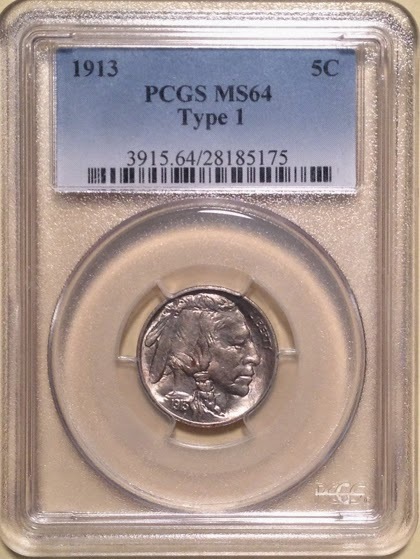 I think perhaps I was entranced by the reverse, which has nice detail - better than some MS66's I've seen selling for $1,000.00, give or take. Anyone who knows me well knows that I generally do not notice detail. The other day we were with my daughter and her husband and were walking by a river. We were standing staring down at the river and everyone was making appreciative noises. I looked and saw flowing water, which is what I thought they were all admiring. It turns out that this river is one where herring run at this time of year and the water was absolutely choked with them. I just didn't notice! So, I'm a "big picture" guy. That's probably from having very poor eyesight that was not corrected until I was well into my school years - I imagine my brain never learned to process details well because I couldn't see them. Whatever the reason, I know I can easily miss things. 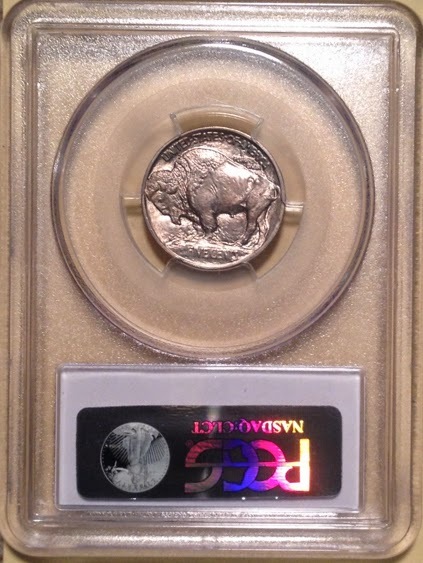 Someday I'd like to buy a better Type I Buffalo. I like the design and don't care that much about Type II. I'll need to force myself to look carefully, though.